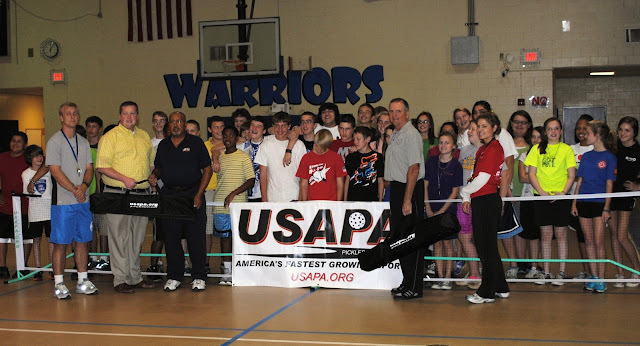 The Sun City Carolina Lakes (SCCL) Pickleball Club in Indian Land, SC not only taught pickleball to Indian Middle School (ILMS) students, they also donated two portable nets to help jump start the program. USAPA member Luis Lopez organized the event held the last week in October. Several members of the SCCL Club worked with students during daily physical education classes. The USAPA nets were purchased by the Club and donated during a presentation ceremony following the week long event. Pictured below are Luis and USAPA ambassador Frank Kinder presenting the new nets to ILMS Principal David McDonald, along with Physical Education teachers Jessica Hardy and Kevin Mager, as students patiently stand by.